We unite in appreciation together on April 19th, 2016 to honor the 13,287 alumni who made this school year possible. Join the Gonzaga community in welcoming a day of gratitude, recognition, and appreciation for the Gonzaga donors that make it all possible. This year we reflect on the Gonzaga alumni of the past who have had a hand in making this year possible. Essentially the tomorrow at Gonzaga is made possible because of the generosity of alumni who gave yesterday. 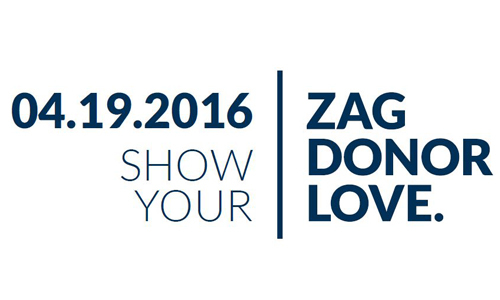 How can you show your #ZagDonorLove? Explore the stations around the John J Hemmingson center first floor from 11AM-2PM with a Passport. Visit 3 stations & turn in your Passport to receive a prize, visit all 6 stations and be entered to win the grand prize, attendance at a luncheon with President McCulloh!